The bulkie KEN PAN in Tilbury with the HANJIN PENANG on the scrap metal berth. More info RWJ. The HANJIN PENANG was built in 1997 for the Hanjin Shipping Co.. at 16,270 grt. Nothing particularly exciting about these two vessels, but it is interesting to see the variety of vessels that one time came to Tilbury. 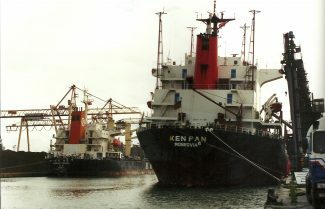 The bulk carrier KEN PAN (20,277 tons gross, 34,607 deadweight) was built in Japan in 1984 as the Japan-owned SERI, and had four owners and four names before she became KEN PAN in November 1996. She traded for seven years under the ownership of Kissel Navigation Ltd, Liberia and was managed by Ikaros Shipping & Brokerage Co, of Piraeus, Greece. In December 2003 was sold to Brave Royal Shipping, of Chittagong, Bangladesh, and renamed BRAVE ROYAL. She is still in service with this owner, although she has been at her home port for some time. The last report I have of her was at 1126 hours on 15 July, when she was at berth in Chittagong without cargo. 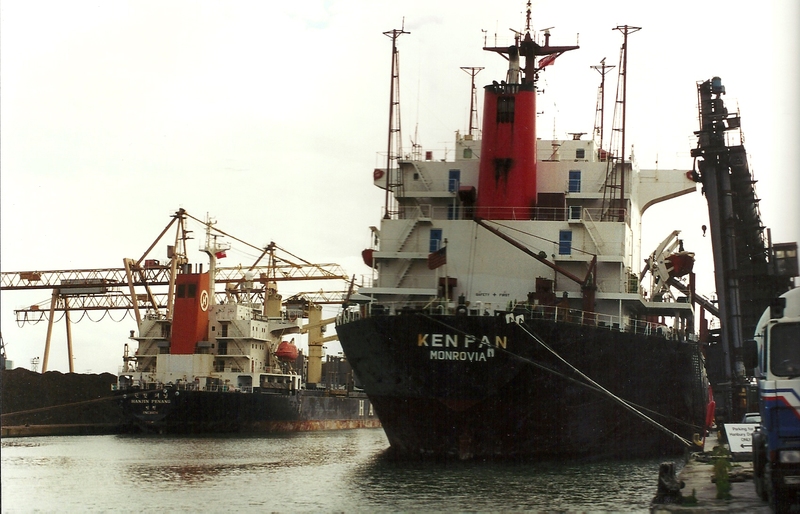 The other ship in your photo was registered in the name of Korea French Banking Corp, of Seoul, Korea, and was leased to Hanjin Shipping Co Ltd from when new in 1997 to 2008, when Hanjin became registered owner. In 2010 it was sold to ES Line, of Pusan, Korea, and renamed ANA-M under the Maltese flag. To add a bit more multinational flavour, the vessel is managed by Zigana Denizcilik, of Istanbul, Turkey.